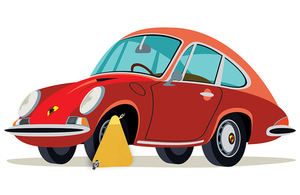 In the last financial year, there were 133,000 vehicles clamped for being untaxed. These included almost 350 prestige cars including 199 Porches, 28 of the Italian supercar, Abarth, 23 Maseratis, 20 Bentleys and even a Hummer. Taking the top spots overall were the UK’s most popular make and models with 6,000 each of the Ford Focus and Vauxhall Astra. And 73 London Taxis, 5 Harley-Davidsons, 4 motorhomes and an Iris Bus were also clamped for being untaxed. Still making the top ten most popular colour of vehicles to be clamped was silver with more than 32,000 clamped during the year, 2,000 more than the previous year. Black vehicles just pipped blue vehicles into second place and 690 gold vehicles were also clamped. These figures show that it doesn’t matter what type of vehicle you own, whether it’s a sports car, motorhome or even a bus – if you don’t tax it, we’ll clamp it. It’s never been easier to tax your car – it’s just a few clicks to do it online and you can do it 24 hours a day. Don’t take the risk – it just isn’t worth it. You can check the tax and MOT status of a vehicle anytime via our online vehicle enquiry service. You can tax a vehicle 24 hours a day, 7 days a week.